2 - 4 persons (optional for 6 persons - 3 double rooms for an extra charge). In beautiful, close to nature location in the middle of the Lungau mountains you will find our apartment resort Hackenschmiede. Both in summer and in winter, this is the ideal place to relax, unwind or exercise. In our cozy and fully equipped luxury apartments, you will find many amenities, so you can really enjoy your holiday with us. The large garden offers plenty of space for children or sociable barbecues, an on-site tennis court is available for free. Our infrared cabin in the *** s country house guarantees you after every physical activity the restful and well-being refreshment. Our apartment resort has a total of nine apartments (four apartments in the **** residence, three apartments in the *** country house and two apartments in the *** holiday house). For example, we present four apartments on this platform, where there is the apartment type 'pond rose' in the **** residence three times (apartment for four persons). Ski possibilities: The **** residence, the *** country house and the *** house to the heelforge lie at the foot of the ski area Großeck-Speiereck. If you want to go to the world-famous Obertauern ski resort - no problem - a 2-minute walk from your apartment, the ski bus will take you there for a few minutes. They are also transported quickly and free of charge to the Katschberg or Fanningberg ski areas! Mauterndorf in summer: Here begins the holiday, 1000 meters high above the everyday life. Nestled between the lower Tauern and the Nockberge lies the historic village Mauterndorf, in the holiday region Lungau. At every step you can feel the exciting tension between a real holiday landscape and the harmoniously grown structure of the centuries-old market. Imposing town houses give the place its face. The days go by with pleasure on bike hiking or rafting tours, climbing adventures or relaxing hours in the well-kept oasis of well-being in the Apartment-Resort Hackenschmiede. The from the 13. Mauterndorf Castle, which dates back to the 13th century, dominates the historic town of Mauterndorf and always accompanies you as a viewing object during your holiday in our apartments. Mauterndorf in winter: The sun transforms the winter white snow blanket into a bright sparkling sea of diamonds. Have you ever wondered what it means to never forget a sight? Experience winter in Mauterndorf and you will know. Whether for skiing, snowboarding, cross-country skiing, winter hiking, tobogganing or touring skiing. Thanks to the healthy altitude you can find the best snow conditions until late spring. In addition, Mauterndorf is located in the middle of the famous ski regions Obertauern and Katschberg, so that nothing stands in the way of a varied ski holiday in Austria. Incidentally, this also applies to families with children, because the ski areas are considered to be particularly family-friendly with numerous blue runs. Enjoy the sauna and the infrared cabin, as well as our own heated swimming pond and tennis court! We loved our stay here, the village is just beautiful and the apartment very comfortable. The thing that really made our stay memorable was our host, Thomas. He was so accommodating and helpful in every way. He helped us to arrange bike hire for the 6 of us as well as white water rafting. Nothing was too much trouble for him, a true gentleman. We would recommend staying here, it is paradise. The apartment is very beautiful, especially the landscape from the window and the modern furniture. The owners are very hospitable. Tolle Wohnung, ideal mit Kindern, sehr sauber, einfach empfehlenswert. Die Wohnung hält mehr als die Werbung verspricht. Die Lage und das direkte Umfeld mit Wiesen und einem einmaligen Bergpanorama sind traumhaft ; die großzügige Terrasse lädt zum Sonnenbaden in ein. Wir wurden sehr freundlich vom Vermieter persönlich empfangen und umfassend über die Wohnung, den Ort und auch über Freizeitmöglichkeiten informiert. Die Wohnung selbst war in einem perfekten Zustand, in einer einmaligen Art und Weise saniert und behutsam mit authentischen Details hergerichtet. Wir haben uns wirklich wohlgefühlt und werden das Objekt auch an Freunde gerne weiterempfehlen. My family stayed at Apartments zur Hackenschmiede in the App. Thomas, using an extra room opposing the main apartment. Both were very spacious and airy, had great views and were spotlessly clean. The heating could be individually controlled which we really appreciated, previously having a few bad experiences with freezing cold accommodation. Both the apartment and the extra room had balcony access and a lot of light. The apartment house has a great location in Mauterndorf, nearby a lovely stream (must be great in summer) and opposing the Burg. The access road leading to the house was kept cleared of show for the duration of our stay, in spite it showing almost on a daily basis. The house also features an IR cabin, a sauna and a ski room, all free of charge, which was a great addition. All of the amenities listed on the proprietor's web site were present in the apartment. Bathroom amenities were brand new, furniture in App. Thomas traditional and in good shape, most furniture in the extra room brand new (great TV!). The kitchen was well equipped, the dishwasher being a huge plus, though we somewhat missed a microwave which would have been nice, as well. One thing that does stand out from an otherwise great standard is the cutlery - we struggled to find two matching pairs of forks/spoons/knives etc. Doesn't really make much of a shortcoming, but is something that could be improved on. Towels were changed twice weekly. 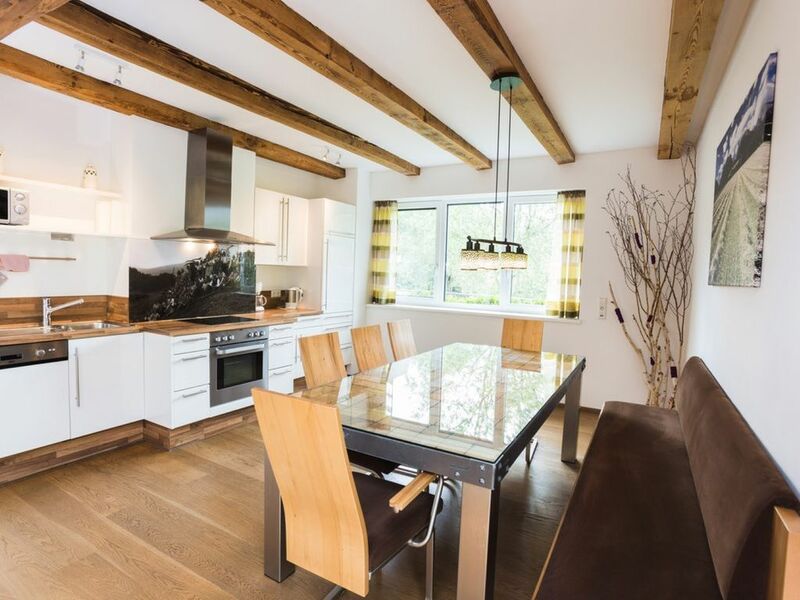 In overall, Apartments zur Hackenschmiede present an excellent option for a self-catered ski trip to the Mauterndorf/Obertauern area, offering spacious, well maintained, fully equipped accommodation with a great value for money ratio. Highly recommended! Many thanks for your review. We are pleased to read, that you had a nice time in Mauterndorf! We wish you all the best! Wunderschöne Wohnung auf höchsten Niveau. Komplett ausgestattet mit Internet, Fernseher und allen Annehmlichkeiten einer Ferienwohnung. Zentral gelegen, alles im Ort zu Fuß zu erreichen, ebenso die Wanderwege direkt von der Wohnung zu begehen. Trotzdem eine sehr ruhige Lage ohne irgendwelche Lärmbelästigungen. Wunderschöner Garten mit Naturbadeteich und sehr netter Kontakt zu den Vermietern. Vielen Dank für diese informative und positive Bewertung! Alles Liebe! Our *** s country house, our *** cottage and our **** residence to Hacking Forge are just a few minutes walk away from the centuries-old, historic market Mauterndorf near Obertauern. Also otherwise offers Mauterndorf near Obertauern with its imposing walls and the castle Mauterndorf much to discover. Both in summer and in winter vacationers in the Lungau mountains can experience a lot. Whether hiking in the lush Lungau nature, trips to the many Salzburg castles, palaces, pilgrimage churches and museums or skiing on the slopes up to 2400m high. Discover from our house, only a few minutes, with the free ski bus, or with your own car, the famous ski resorts such as Katschberg (www.katschi.com - 15 min), or Grosseck-Speiereck (bergbahnen-lungau min) or the world famous Obertauern (www. obertauern. at - 15 min)! Golf: In the Golf Club Lungau in St. Michael you can play golf at the highest level surrounded by a fantastic landscape. In addition to an 18 - hole course lure generous training facilities and the 9-hole Par3 course. Even beginners and consistent coaches get their money's worth. The ski bus station is a 2-minute walk from the house and in no time you reach the Schizentrum Mauterndorf with the family-friendly and beautiful ski area Grosseck-Speiereck. The grandiose ski world Obertauern is 15 km away - other highly recommended ski areas (Fanningberg, Katschberg-Aineck,) in the immediate vicinity.